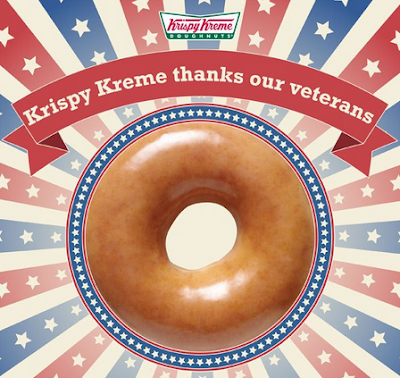 Krispy Kreme will celebrate Veteran’s Day on Wednesday, November 11th by offering a Free Doughnut (any variety) and a Small Coffee to all Veterans at participating Krispy Kreme locations. No purchase necessary. A free doughnut and small coffee will be given to anyone who identifies themselves as a veteran or active duty military personnel (no ID required).